Russia Beyond the Headlines launched a new special section focused on Russian cuisine. On Sept. 1, Russia Beyond the Headlines launched a new special section focused on Russian cuisine. Called “Russian Kitchen,” the section features content that will introduce readers to both contemporary and traditional Russian cooking. Russian Kitchen will include articles about food trends in Russia, tips for foreign cooks in Moscow, and a recipe archive collected from the RBTH website. The Russian Kitchen page will also tie in with the active Russian Kitchen Facebook community, which readers can follow at http://www.facebook.com/therussiankitchen. All posts related to the Russian Kitchen can also be found with the hashtag #therussiankitchen on Facebook and Instagram. 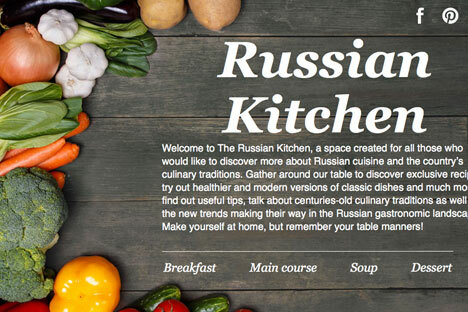 The new Russian Kitchen section on rbth.com will also feature two special projects: Delicious TV and The Soviet Diet Cookbook. Delicious TV (former Delicious Russia), which debuted in December 2012, is a video blog that takes home cooks through the preparation of an entire dish – from selecting the raw ingredients to the finished product. The videos are subtitled and easy to understand. They are also accompanied by texts describing exactly how the dish is prepared, along with the recipe. The cooks in the videos, Andrei Kipyatkov and Yury Stefanov are not professional chefs – Kipyatkov works in logistics and Stefanov is a scientist. They are just guys who like to cook, and they hope the podcast will send the message that people should not be afraid of cooking – anyone can do it! In The Soviet Diet Cookbook, which launched Sept. 5, readers will cook along with Anna Kharzeeva as she works her way through The Book of Tasty and Healthy Food – the go-go guide for Soviet housewives. First published in 1939, the book was intended to free Soviet women from the drudgery of the kitchen so that they could go build communism. In addition to recipes for every occasion, the Book of Tasty and Healthy food featured recipes for every occasion, tips for setting a table and advice for choosing the best wine to accompany your food – never mind that all the ingredients required for your chosen meal may not be readily available. Every week, Kharzeeva – founder of the Samovar Cook and Chat Club, which organizes cooking classes for children and adults in Moscow – will cook an entire meal made of recipes from the book and write about her experience. Her grandmother, Elena Moiseevna, will provide commentary on each menu from her experience using the book as a Soviet housewife. This project may prove especially useful for Moscow-based cooks facing a shortage of foreign ingredients! Look for updates every Friday on the rbth.com website and find them on social media with the hashtag #sovietdiet.